3D printing is also called additive manufacturing and allows you to create three-dimensional objects from a digital 3D model. The 3D model is created with specific software and processed by a 3D printer that, layer after layer, produces the solid part of the 3d model. 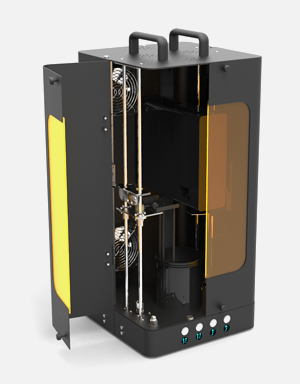 On personal/desktop 3d printers there are no particular differences in terms of quality and resolution between SLA (streolithography with UV laser) or DLP (with DLP projector). In the Top down projection technology the amount of resin used is equal to the height of the object, the object is formed without particular types of stress because it simply grows on a moving tray. No change of resin vat is required. After the use the vat is simply closed and can be safely stored. In the Bottom up projection technology the amount of resin used is less, however, the object undergoes more stress due to the suction effect happening at each layer. You must also make a periodic change of the resin vat or the fep film with additional costs. There are many professional options you can choose such as Solidworks, Inventor, Rhinoceros. There are also some free software like SketchUp or Blender. Always export the file in .stl before going to printing. We also organize training courses on different 3D modelling software at our headquarters in Montebelluna (TV). You can download free software Lumi Creator for your model from download area. The main difference between the two technologies is the accuracy and precision of details that you cannot get with filament 3d printing and can be reached only with stereolithography. 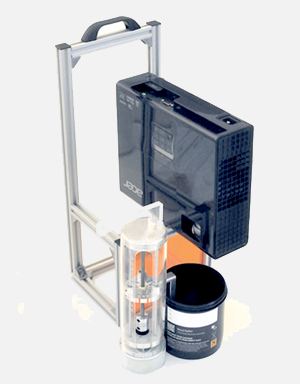 Lumi Industries’ printers are based on DLP stereolithography technology (using a DLP projector) with top-down projection. A liquid resin cures with the light emitted by a projector. On Internet there are many websites colecting suitable models for 3D printing, with a pay or free download. Find here a list of the most important ones. LumiReact Hard & Detailed: suitable for prints requiring an extreme precision and detail. Perfect for silicon moulding. Lumi React Hard & Strong is suitable for parts requiring a certain hardness and for silicone moulding. These resins allow enhancing details accuracy. Available in grey, blue teal or orange. Lumi React Castable is a metal casting resin. Available in orange. Lumi Industries is also the official distributor for Italy of Fun To Do resins available in the following versions: Standard (35 shore D), Industrial (75 shore D), Snow white, Castable (73 shore D) e Deep Black. Resin has a shelf life of 12 month from purchase. Once you open it, it has a minimum life of six months. Store it well covered, in a dry place without temperature fluctuations and away from light sources. It is important to stir very well the resin before every use to avoid pigments deposition. Yes, the resin casting is similar of the lost wax process, considering that the resin does not melt, but burns, therefore the foundry must take appropriate precautions. It depends on printed objects volume. Our resins have a tiny shrinkage factor of 0.5%, therefore the printed object volume approximately corresponds to the volume of used resin. After loading the .stl file to be printed on our software and setting the resin in use, it is possible to know in advance the volume of resin used and the corresponding cost in terms of material. Lumi React resins have been designed to be used on our printers and give the best results; however, our 3D Printers are compatible with most of DLP resins. No, all photosensitive resins are made on an acrylic base and are not recyclable. In the liquid state, they can pollute the environment, therefore they must be cured and solidified before disposal according to your country regulation. For small prints, you can use a low cost UV lamp that can be found in beauty care specialized stores. It’s possible to buy Lumi Industries’ 3d printers, accessories and consumables through our site store or with a direct order to info@lumindustries. You can also contact one of our authorized distributors. Advanced payment with Pay-pal, credit card (only for online store payments), bank swift or cash on delivery (additional fee applies). Lumi Industries issues regular invoices as per the Italian law. Only for private costumers ordering from Italy, please always provide the fiscal code. For national or international companies’ orders, please provideboth Fiscal code and VAT number. Only EU or Extra EU registered companies are entitled to VAT exemption, upon providing VAT or company registration number. In almost every country in the world except USA, Mexico and Canada for LumiForge. Shipping cost for each order is calculated during the online or direct purchase according to order's weight and volume and shipping country. National and European orders are shipped with GLS/FEDEX courier, while for extra EU we offer FEDEX or DHL Express service. Orders are shipped as soon as possible, based on product availability and follow the chronological order of receipt. It is possible scheduling an appointment in advance. What are sale terms and conditions? Lumi Industries' terms and conditions for both direct and online store sales are available here. Please contact our support service: support@industries.com, attaching photos and detailed description of the damage or malfunction. If the parcel you received from the courier is evidently damaged, please always sign conditionally. If an out-of-warranty reparation is needed, we will make an individual assessment of required assistance and resulting costs which will be sent to the client for confirmation.